For someone seeking to spend the weekend with nature, Nag Tibba serves as fitting trekking destination nestled in the Garhwal Himalayas. At 3022 metres, it is the highest peak in lower Himalayas of Uttarakhand. It is an all-weather trek- During winters, the presence of snow gives the entire trek a heavenly view. The same trek is surprisingly different during post monsoons, with fresh leaves and flowers giving a strikingly greener tint to the entire area. 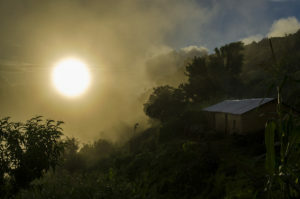 It is also a relaxing trek during summers to get respite from the scorching heat. 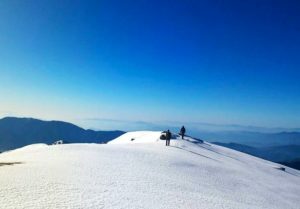 On the Kedarkantha trek, the winter snow sets in by the middle of December and lasts until the third week of April. You will probably come across snow just as you cross the 10,000 feet mark, lying on the forest floor among the pine trees. When you reach the meadows, it is likely to be a huge blanket of white around you in every direction. 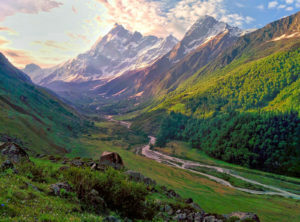 This trek has the prettiest campsites in the Himalayas. Not all treks can boast of the beauty of its campsite like the Kedarkantha trek. Each of its campsites is unique in its beauty. Also, the drive to Kedarkantha is a remote route so exquisite that it is one of the most beautiful drives in the Indian Himalayas. Kuari Pass trek is a short trek in the Nanda Devi Sanctuary. Though the pass is not very high, it offers excellent views of Nanda Devi, Dunagiri and other 7000 m snow-capped peaks that extend into Tibet. 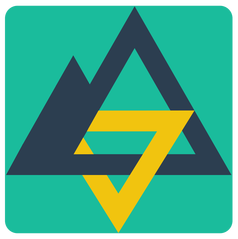 Kuari, meaning “doorway” is a Himalayan high mountain pass located in the Garhwal region of northern India, south of the Tibetan border and on the western rim of the “Nanda Devi Sanctuary” Biosphere Reserve. Har ki Dun, which means Valley of Gods, is situated deep inside Govind Pashu National park. Rich in flora and fauna, the trails are quite often covered in different shades of orchids and other wild flowers. The area was made popular by the Doon schoolmaster Jack Gibson, after his Banderpunch expeditions. The path winds up alongside the Tons river from Netwar village through the scenic villages of Gangad and Osla. Har-ki-dun has numerous camping places and one Forest Guest House. An extra rest day is ideal to proceed to get a clearer view of the Jaundhar glacier. Few winter treks in Uttarakhand are as adventurous and stunning as the Brahmatal Trek. 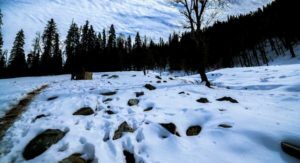 The amount of snow at the Trek teases every trekker to take up the challenge. Forests, coupled with impressive views of the Himalayas, are a treat to the shutterbugs. Brahmatal reveals a heavenly face in winter when the snow gently falls on its slopes. The frozen lake, with the mighty Himalayan peaks overlooking it, creates a mesmerizing ambience. Summits, towering way over 7000 meters, leave trekkers awe-stricken. 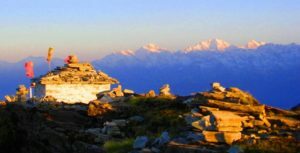 A quaint and rustic village in Uttarakhand, Tungnath is better known as the starting point of the much acclaimed Chopta Chandrashila Trek. This picturesque hamlet is adorned with the enchanting beauty of the evergreen pine, deodar and rhododendron forests. 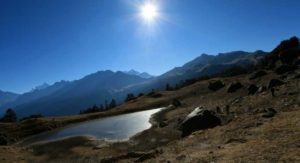 Its myriad list of offerings and pictorial appeal has earned it the fame of being called the ‘Mini Switzerland of India’. During the summer or spring, the charm and appeal of the exotic vegetation embrace the entire vicinity. While during the winters, Chopta wears a thick blanket of snow that makes it even more appealing. Got other destinations in mind, didn’t we mention that all you need to do is place your finger on it?